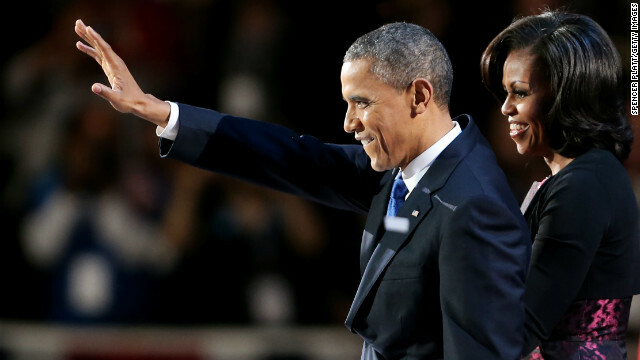 U.S. President Barack Obama stands on stage with first lady Michelle Obama after his victory speech on election night at McCormick Place November 6, 2012 in Chicago, Illinois. (CNN) - An emotional day followed the most expensive presidential election ever in the U.S. But early Wednesday morning, after 1:00 AM Chicago time, supporters and campaign staffers for President Obama could finally breathe a huge sigh of relief; this long campaign and election was finally ending in victory. But a different set of tears was evident in Boston, where supporters of Mitt Romney had gathered to watch the election returns come in. [3:46] "I'm really disappointed he lost this evening. I thought we had a real opportunity here to help start to shift the direction of the country. The last four years haven't been very successful in a lot of measures. And it's not clear to me what's going to change in the next four years to make it any more successful." Editor's Note: What did it sound like at the moment the campaigns learned their fate? Our correspondents covered the election night events from both candidates' headquarters. In this report, they bring you the sounds and emotions of the final stage of a long and tiring presidential campaign. Listen to the complete story in the player above.